Our clients are extremely important for us and it is our utmost responsibility that the numerous requirements of our esteemed customers are fulfilled, as per the commitments. We have earned a long list of valuable customers, who place immense trust in our capabilities and depend upon us for the accomplishment of their diversified requirements. To cater to the varied demands, we offer the selection in numerous specifications. To ensure the quality and flawlessness, our quality analysts checked the entire range, before it final dispatch. Being a quality-conscious organization, we are committed to offer quality assured products at the clients’ premises. We procure raw materials from the reliable vendors in the market to manufacture our products. Further, our professionals utilize highly advanced and latest machinery and technology to fabricate these products, which are accounted for their dimensional accuracy, performance and robustness. Further, to attain highest degree of excellence, our skilled quality controller stringently tests the entire range against various quality parameters. We also value customer’s feedback in terms of quality to improve our product range. We are an ISO 9001:2008 company. 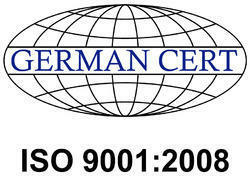 ISO 9001:2008 is the most widely applied international standard. It strength lies in the fact that the same standard can be used in any organization in any industry, of any size, anywhere in the world. Registration to ISO 9001:2008 by a UKAS accredited body provides objective proof that a business has implemented an effective quality management system, and that it satisfies all of the requirements of the applicable standard.